DERRY came to a virtual standstill on Thursday as a city numb with grief paid its last respects to the five victims of the Buncrana pier drowning tragedy. 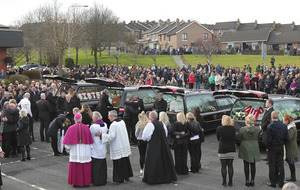 As thousands turned out for the funeral service at Holy Family church, shops closed and hundreds of people lined the route from Ballymagroarty amid heart-wrenching scenes as five hearses moved slowly through the city. Flanked by police outriders, staff at St Mary’s College, where Jodie-Lee had been a pupil, bowed their heads while school-friends hugged each other and wept as the fleet of black cars moved slowly by. At Northland Fire Station, officers standing by three tenders stood in silent tribute while police officers stood to attention for the salute as the cortege passed. 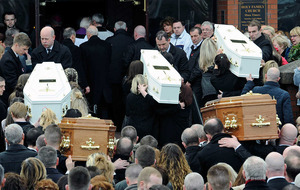 Earlier as he received the five coffins at the Church of the Holy Family, parish priest, Fr Paddy O’Kane said Derry had been plunged in grief. As he recalled the moment when the McGrotty and Daniels’ families closed their coffin lids on their loved-ones for the final time, he noted that it had rained outside. “Even the heavens are crying," he said. "Five beautiful people have been taken tragically from our midst. Five people whom we loved. Not just this family, this community this country but also people from all over the world are untied with us in grief,” he said. As the five hearses arrived in the car park of Holy Family church, hundreds of mourners closed in on the grieving families in a gesture of comfort and support. The depth of the heartache was painfully clear. Men, women and children wept as first three white coffins and then Ruth and Sean’s coffins were received into the church. Before the altar were five large pictures of the victims while friends carried forth gifts which were symbolic of their lives. There was applause for Davitt Walsh who dived into the freezing waters of Lough Swilly to save the only survivor, baby Rioghnach-Ann. 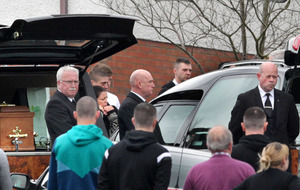 Still bearing the scars of his heroic efforts, Mr Walsh joined mourners along with his girlfriend, Stephanie Knox. Tribute was also paid to Francis Crawford who witnessed the tragedy and called for help. Fr O’Kane said Holy Week was a “special week of grace”. Then in silence, the people of Derry laid their tragic dead to rest.